Six Boer × Spanish wethers (21 ± 1.0 kg initial BW and 7 to 8 months of age) were used in two simultaneous 3 × 3 Latin squares to determine effects of different lengths of access to pasture with moderate to high mass of forage of high nutritive value on energy expenditure (EE), recovered energy (RE), metabolizable energy (ME) intake and grazing activities. Wethers grazed a 0.7 ha pasture of a mixture of cool season forages in the fall/winter period for 4 (12.00 to 16.00 h), 8 (08.00 to 16.00 h) or 24 h; 4 and 8 h wethers were confined as a group in an enclosed facility at other times. Periods were at least 18 d in length, with 4 d for total feces collection in bags, 2 d to measure heart rate (HR) and grazing behavior and 1 d without feed or water for assessing body composition from urea space and shrunk BW. EE was based on HR and the predetermined ratio of EE:HR for each wether, and ME intake was the sum of EE and RE. Forage DM mass was 1985, 2016, 1634 and 1000 kg/ha at the beginning of period 1 and end of periods 1, 2 and 3, respectively. Hand-plucked forage samples averaged 22% crude protein and 39% neutral detergent fiber (dry matter basis). EE was greatest (P < 0.05) for 24 h of pasture access (4.96, 5.13 and 6.19 MJ/d; SE = 0.253), although RE was similar among treatments (0.88, 2.16 and 1.57 MJ/d for 4, 8 and 12 h, respectively; SE = 0.361). Intake of ME was greater for 8 and 24 h vs 4 h (5.84, 7.30 and 7.76 MJ/d for 4, 8 and 24 h, respectively; SE = 0.530). As length of pasture access increased, number of steps (2.51, 4.57 and 6.41 x 1000), time spent ruminating (4.42, 6.33 and 7.28 h) and time eating (3.77, 6.35 and 7.24 h) increased (P < 0.05) and idle time (15.81, 11.32 and 9.48 h) decreased (P < 0.05), whereas time lying was greater (P < 0.05) for 4 and 8 vs 24 h (8.39, 8.25 and 6.66 h for 4, 8 and 24 h, respectively; SE = 0.161). 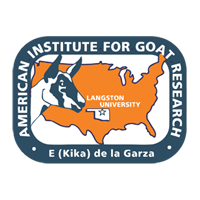 In conclusion, with moderate to high mass of forage of high nutritive value, limited pasture access of a minimal length could yield performance by growing meat goats at least comparable to that with continuous access.